For more than a year, Wally the rabbit - who might just be the most famous bunny ever - has been capturing the hearts of people around the world. And now, Wally has someone very special to capture his own heart. 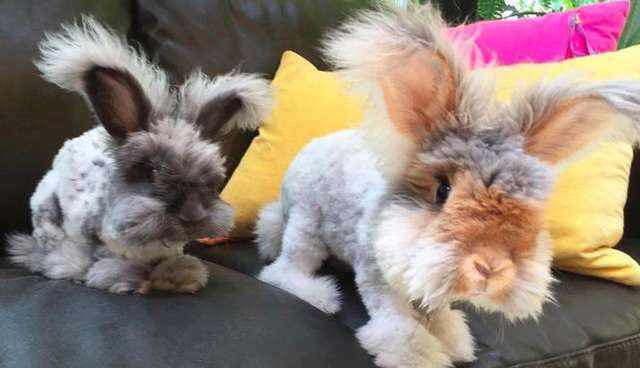 On Friday, Wally's owner Molly Prottas announced the arrival of Wally's new lookalike best friend: a little female English Angora rabbit named Suki. "One bunny ... two bunnies ... TWO BUNNIES!" Prottas wrote on Instagram. "I can count my bunnies! Because I have two!" Suki, who's the same breed as Wally, is the perfect mini-me for the furry Instagram star - she's even perfected his signature move of the happy flop. Suki also shares Wally's unique haircut, though the story behind her looks is a bit sadder. Prottas rescued Suki from the Animal Care Centers of New York, where she had to be shaved due to a previous life of neglect. "Her matting was terrible, it was one of the worst cases of matting they had seen," Prottas told The Dodo, noting that her brother who came in with her had signs of physical trauma. "Her muscle tone was very weak. It was assumed she had probably been left in her cage for most of her life." But that didn't stop Prottas from falling in love. "She was adorable," Prottas said. "Wally is very sort of - I see him as this very athletic bunny ... She was like a newborn baby lamb. She was skipping and her legs were splaying out to the side ... She was so sweet." Prottas said she had been looking for another rabbit for months as she hated leaving Wally alone every day when she went to work. Rabbits are highly social and often do better in pairs - though the bonding process can famously involve weeks of fighting and jealousy before any two rabbits accept each other and work out their power structure. Wally was no exception. "There were a couple times when they really started fighting and it was difficult to break them up - like fur went flying," Prottas said. But Suki seemed determined, and would often tiptoe up to Wally and almost reach him before becoming scared and darting away. "She was the one who'd always walk over to him, or follow him up onto the bed," she added. "He was very aware of her presence, but he would try to play it cool. He would lie out on the floor like a lion watching her." Finally, however, Wally relented and accepted the eager little Suki as his bonded mate - almost. Prottas said he still gets defensive when she tries to venture onto the bed, as Wally often sleeps with Prottas and views the bed as "his" territory. "Wally doesn't like her on the bed," Prottas explained. "That's like his domain." However, she said, the pair has turned into quite the affectionate couple. "They're great," she said. "They cuddle. I can tell it's even going to develop more." And, at least in Prottas' slightly fictionalized online narrative of his life, Wally isn't looking back. "Don't even WORRY that it's Monday! Wally's here for you! I'm HERE!" Wally wrote in his Monday post, a weekly tradition designed to help his followers combat the beginning-of-the-week blues. "And guess who's here for ME?! SUKI!" For more of Wally's (and Suki's) adventures, you can follow them on Instagram. Want to help a Suki of your own? Visit Adopt-a-Pet.com to find rabbits in need near you. Need even more Wally? See him in action below.